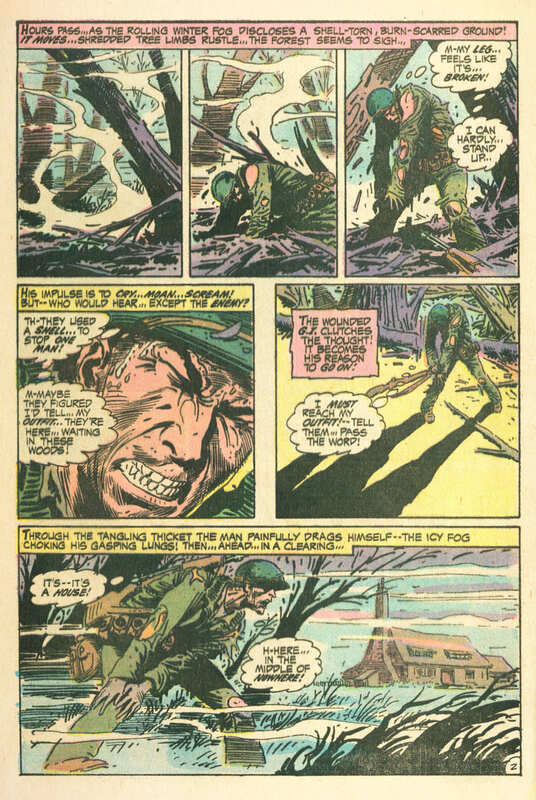 Weird War Tales was a hybrid horror/war anthology comic that ran for 124 issues over 12 years (1971 - 1983). Changes to the Comics Code Authority resulting in relaxing its decades long stance on censoring the use of monsters and the undead in mainstream newsstand comics brought about a resurgence of horror-based comics in the early 1970's. 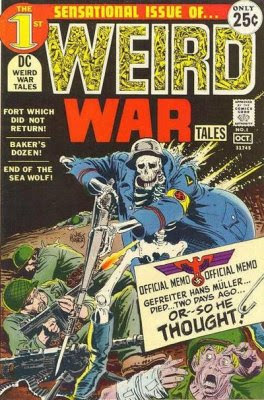 Weird War Tales was one of the longest running and most successful comics to come out of the relatively short-lived new horror trend. . .mostly because other horror titles just really weren't scary and didn't last very long. The hybrid nature of Weird War Tales combined appeal to two separate audiences and was able to cover a wide range of historical time periods, making it possible to tell a wider variety of stories than other horror comics. Weird War Tales was hosted by Death, who appeared in different military garb in every issue. The kinds of stories that appeared during the comic's run were typically gritty combat tales with elements of suspense, fantasy, science fiction, horror, and paranormal activity. Over the course of Weird War Tales' 12 year run, a wide variety of legendary comic creators worked on it, including Joe Kubert, Robert Kanigher, Alex Toth, Russ Heath, Walt Simonson, Frank Miller, and MANY others, making Weird War Tales a veritable who's who of comic greats. But enough history. Let's take a look into the issue at hand. . . So what we have here is a pretty hefty book at 44 pages, with 4 stories, a 1 page text story, and a framing story split into two parts at the beginning and end of the issue. That's a lot of comic for a friggin' quarter! They sure as hell don't make 'em like that any more. Let's break it on down. . . The first half of the framing story is written and drawn by the legendary Joe Kubert, with (in my humble opinion) some of the best art I've seen from him. In case you can't tell. . .I'm a bit of a Kubert fan. In my humble opinion, Joe Kubert IS war comics. It's winter, 1944. A lone American soldier separated from his unit is attacked and wounded by Germans hiding in the woods. As he desperately tries to return to his unit to warn them about the hidden enemies waiting for them, he stumbles onto a house in the middle of the forest and is rescued by a mysterious old man who starts telling him strange war stories. . . The utterly fantastic art aside, this short piece is a great opener for this issue AND this series! In a few short pages, it encapsulates the entire concept of Weird War Tales in a way that modern comic creators seem to have lost a grasp of. The first full-length story is actually a reprint from 1961's G.I. Combat #86. It seems a bit odd to throw in a reprint for the lead story on a new series. Maybe DC wasn't entirely confident in their new anthology. But it's in there, so let's take a look. . . The lone survivor of the crew of a B-17 bomber named "Mother Hen" remembers the harrowing last flight of the plane and decides not to tell the truth about what happened in his report. . .that somehow the battered bomber made it over the target even though all the crew except the Bombardier had been killed. This might be a reprint, but it's an excellent story! The art is remarkable and really shows the desperation and frantic action as the bomber squadron is picked apart in battle. The planes and combat scenes are particularly well done. The story is action packed and tense. The supernatural elements don't come in until it's almost done with, but even without them, this is just a fantastic, gritty piece of comic art. This short 3 page piece tells. . .well. . .the story behind the issue's cover. A German Corporal is killed while out on patrol but he doesn't realize he's dead and tries to warn his commander that there are enemies nearby. When he gets no response from anybody, the knowledge of his death and the extreme guilt of losing his men doom the lost spirit to wander the battlefields forever. I really liked the idea of telling the story behind the comic's cover. It's short and sweet, but nicely done and with more fantastic art from Kubert. Another reprint story. I begin to sense a bit of a theme in this first issue. . .
After the end of WWII, a former German Submarine Captain tells the tale of the final voyage of his boat, the "Sea Wolf", which was sunk during a brutal battle with a mysterious and seemingly unstoppable ship. The story on this one wasn't so great, and the "twist" ending (the ship they are salvaging is actually his own submarine he's been talking about) isn't that clever, but the Joe Kubert art is absolutely stunning! Kubert could damn sure draw some great naval scenes. This one page text piece's writer isn't credited. It's a pretty interesting short summary of the Pacific Theater's Battle of The Bismark Sea. It actually reads a bit like an outline for a regular comic story, and I wonder if that's what it originally was. It swings from technical specifics and details of the battle to personal moments and brief snips of dialogue. When a superstitious commander gets a 13th man assigned to his unit on Friday the 13th, he and his men are convinced that the bad luck will be the end of them all. During a series of mishaps and misadventures through the day, they come to understand that the 13th man is actually their good luck charm. I like that this story is a little light-hearted, but it's really not that great. The dialogue is pretty hokey. The art is decent, but Russ Heath and Joe Kubert are hard acts to follow and it really shows. There's some good moments in both writing and art, but not many of them. The story isn't BAD, it's just sort of average. The second half of the bookend story begun in the front of the issue. The wounded American soldier feels strong enough to move on after a night of listening to the mysterious old man who rescued him tell strange war stories. When the G.I. asks an old woman on the road for directions, he learns that the house he spent the night in was destroyed during WWI, along with everyone in it. . . The end of the story was pretty predictable, but it was still good. . .and of course there's more dark and moody Kubert art to kick it up a notch. A great finish for the issue. I'm a bit on the fence about Weird War Tales #1. On the one hand, the stories are, for the most part, good reads and still hold up very well, even after more than 50 years for some of them. It's also packed full of (mostly) great art, featuring a heaping helping of the legendary Joe Kubert. But on the other hand. . .
All of the stories in this issue are reprints, except for the framing story and an extremely short piece in the middle telling the tale of the issue's cover. I'm not sure if the text piece is reprinted, but it looks to me like an outline for an unwritten comic story and seems a bit unnecessary. One would think that there would be more original material in an opening issue of a new series. Overall, I think the good and bad pretty much equal out in this case. If the stories and art weren't as good as they were, I'd find this issue a very disappointing pile of reprint crap. But luckily, that's not the case. Even though this comic is mostly reprinted material, it's still pretty damn good reprinted material, for the most part. I'm not sure what DC's thinking was, but I have the feeling that they were sort of testing the waters with this issue. Back to Longbox Junk business as usual with Marvel's 1983 Falcon mini.